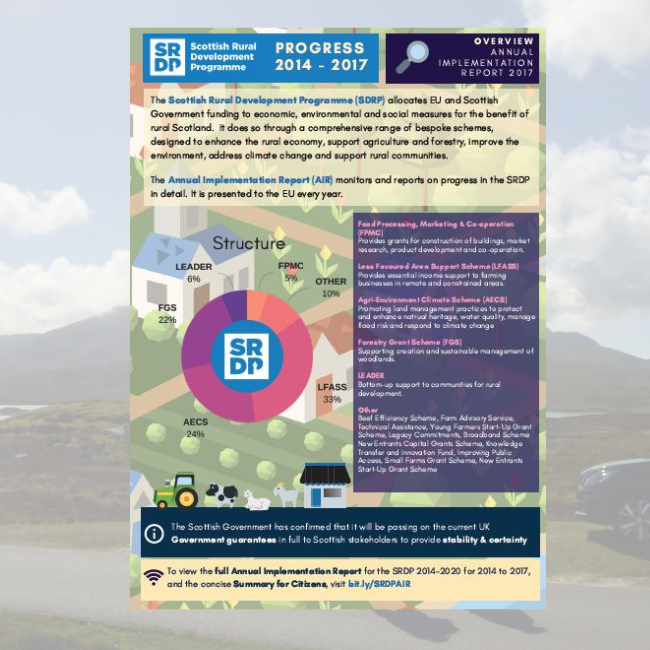 The Annual Implementation Report for the Scottish Rural Development Programme 2014-2020, for the calendar year 2017, was submitted to the European Commission and accepted on 10 August 2018. The full report, as well as the accompanying Monitoring Annex, and the Summary for Citizens can be accessed here. The Scottish Rural Network has broken down some of the key points outlined in the report and presented them in a two-page illustrated summary, which you can view here. It gives a breakdown of the structure of the SRDP and where €​188.4m of funds were allocated over 2017.